If a commentator ever says “nobody wants to see that” about an incident at a football match, you can be sure that ABSOLUTELY EVERYONE wants to see it. Take the Wenger-Mourinho rutting stag act in which the lanky one alpha-maled it all over his special counterpart’s territory. “Nobody wants to see that”. Wrong: everybody wants to see it. On repeat. For an hour. But imagine some real stags slapping each other around on the touchline at Stamford Bridge. Even the commentators would have some fun with that. ITV can never get enough footage of Benfica’s eagle flying around the Estádio da Luz on a Champions League night, and if a squirrel starts burying his nuts in the centre circle at the Etihad you can bet that Clive Tyldesley will be far happier than if a streaker were to try to do the same. Perhaps it’s got something to do with the birds and beasts on our club crests, but the world of football seems to be a world of animal lovers. Indeed we often have more time for appearances made by visitors from the animal kingdom than by the representatives of our own club. From the fleet-footed chicken in the 1986 Cup Winners’ Cup Final between Atlético Madrid and Dynamo Kyiv, a possible inspiration for the first scene of City of God, to the Riquelme-like squirrel who appeared at Highbury in the 2006 Champions League semi-final between Arsenal and Villarreal, not forgetting the errant duck who stopped the Zulte Waregem vs Lokeren match in Belgium or the mercurial marten that eluded several players only to bite FC Zurich left-back Loris Benito, there have been plenty of amusing incidents. As is often the case in football, the source of joy in stands can cause consternation on the pitch. Even a team that has practiced man-marking to perfection will sometimes be at a loss when trying to catch a rampaging dog. This peculiar combination of animals and football, where anonymous creatures make fools out of millionaire world stars, gets a big chunk of the end of the year sports montages. Some animals have such field presence that they become stars. In the quarter finals between England and Brazil at the 1962 Chile World Cup, a dog stole the show. Not only did it invade the pitch and stop the game, but it proceeded to reward Jimmy Greaves, the only player able to catch it, by generously emptying its bladder onto Jimmy’s white shirt. Back in 1962, teams had the strange belief that one shirt was enough for one game, so Greaves had to play the remainder of the match smelling of dog’s urine. Garrincha found the episode so funny he adopted that dog and named him “Greaves”. Some animals become famous for the wrong reasons. When goalkeeper Chic Brodie collided with another canine invader while playing for Brentford away at Colchester the injury ended his professional career. Elsewhere it’s been the humans who have injured the animals. Whatever people say about football fans, they should be in the good books of animal rights activists. In another Argentinian incident, a Club Sportivo Bella Vista de Tucumán player took a contrasting strategy to Greaves, grabbing the visiting canine by the throat and trying to throw him over a fence. His actions ignited the fury of the home crowd and got him a red card for aggression. Luis Moreno remains in danger of only being remembered as the footballer who kicked an owl. It happened when he saw a standing owl on the pitch in a Colombian League match between Atletico Junior and Deportivo Pereira in February 2011. It didn’t help him that the owl was the opposition’s mascot and died later from the kick, He was punished by his club and by nature conservation authorities; it was also rumoured that he was on the receiving end of death threats. While some animals invade the pitch, others are just spectators. Perhaps most memorable of all birds in football folklore is the Maracanã owl, that 26 years ago, landed on the top corner of the goal frame in one of the world’s most revered stadiums. In a game between Fluminense and América, it remained, perched there for a while, both majestic and enigmatic, to witness the end of a 2-2 tie. Even the most philosophical of footballers (Sócrates perhaps?) would be at a loss as to what it was thinking. Was it looking for rats? Was it considering the tactical preferences of both teams? If so, was it for a three men or a four men defence? Did it favor man-to-man marking? Was wing play of particular interest? 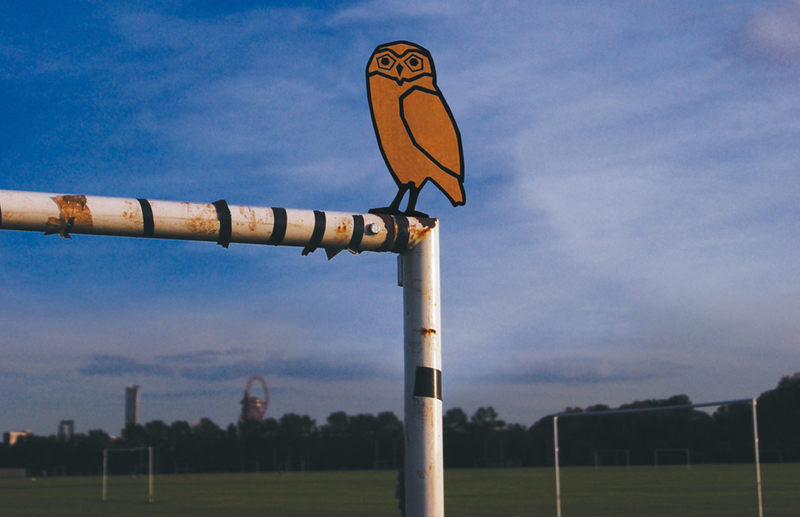 Whatever it thought, the spectators of that wonderful moment in football history had a use for this pensive owl. Since then, the most elusive and spectacular of goals, when the ball enters the goal between the crossbar and the goalpost, the top corner, that most coveted finishing target, has been known by a more poetic nickname in Brazil than it’s dowdy English counterpart, the postage stamp. In Brazil, that is “where the owl sleeps”. And such is the joy of football that, from the Maracanã to the Hackney Marshes, following a Pirlo free kick or a lucky header from Joe-from-the-office, the sight of a ball entering a top corner can be named after that other special sight. Onde a coruja dorme.